parsley is distributed under the terms of the GPLv3 or higher license. This also affects all included files without a license header (non-source files like images), unless they are explicitly mentioned as third-party content. Read the Dependencies section for included third-party stuff. The following packages are available. Choose the one which matches your operating system or environment. Please also check for requirements. 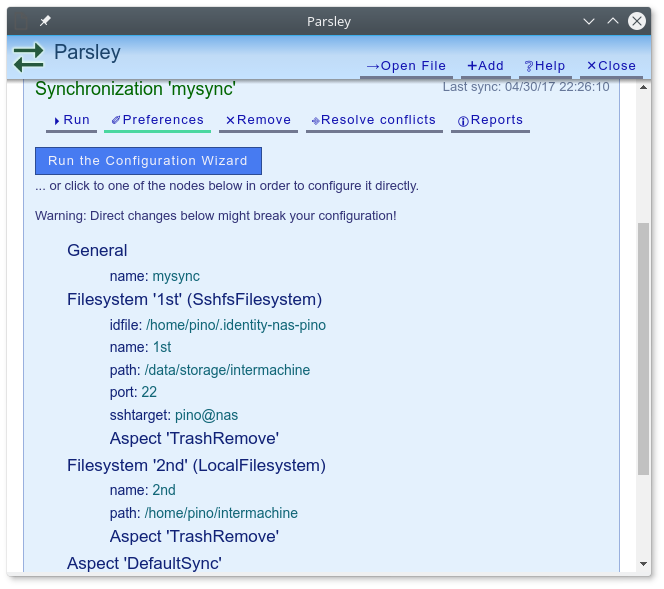 Install parsley as Flatpak on most modern Linux systems by installing application 'pi.no.parsley' from repository 'https://pseudopolis.eu/wiki/pino/projs/parsley/flatpak'. Install $ sudo pacman -S flatpak before you can use Flatpak in Arch Linux. Install $ yum install flatpak as root before you can use Flatpak in CentOS. Install $ apt install flatpak as root before you can use Flatpak in Debian. Flatpak is directly usable in Fedora without further work. Install https://github.com/fosero/flatpak-overlay before you can use Flatpak in Gentoo. Install $ sudo zypper install flatpak before you can use Flatpak in openSUSE. Install $ yum install flatpak as root before you can use Flatpak in Red Hat. Install $ sudo apt install flatpak before you can use Flatpak in Ubuntu. Use the .gpg for optional repository signature verification. There are external parts which are used by parsley. Many thanks to the projects and all participants. font 'Symbola' included : for logo symbol; free for use; copied from here. banner image included : _meta/homepage_bannerimage.png; license CC BY-SA 3.0; copied from here. all files in /_meta included : if not mentioned otherwise, Copyright 2015 Josef Hahn under license CC BY-SA 3.0 license. 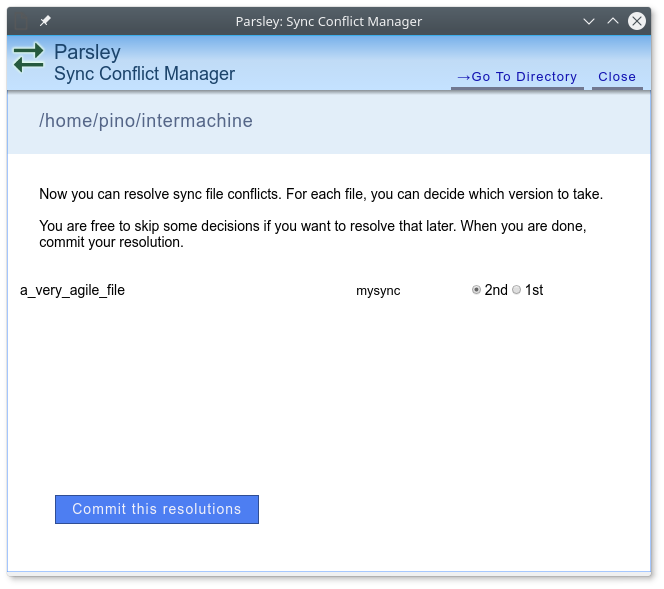 The new report feature shows performance data and logging information for sync tasks. A new, web-based user interface replaces the old, Tk-based one. 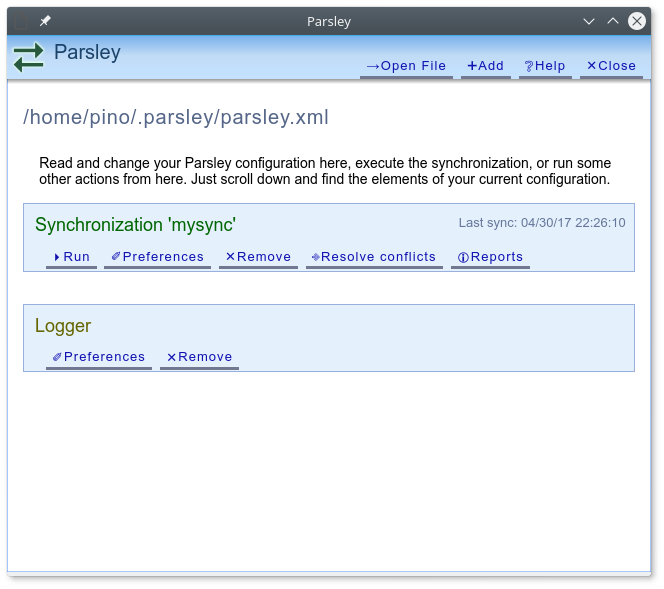 New feature for fine-grained time measurement of sync runs. Dropped some exotic functionality (like repeated task execution). Refactored many internal structures and clarified large parts of the programming interfaces. If you have funny rants about parsley itself or about some techniques it uses, some constructive feedback, a cool patch or a mysterious problem, feel free to mail it to parsl.nosp@m.ey@p.nosp@m.seudo.nosp@m.poli.nosp@m.s.eu. Please use the bugtracker if you have found an error in the software.